Fluke 922 was designed and built for how (and where) you do your job, with performance, ruggedness and ease of use, setting the Fluke 922 apart from the competition. The bright white display and ruggedized holster and wrist strap let you take the Fluke 922 into less than ideal environments. The color-coded hoses help you keep track of where your readings are coming from. The simple, intuitive interface means you can measure pressure, velocity, or airflow at the push of a button. 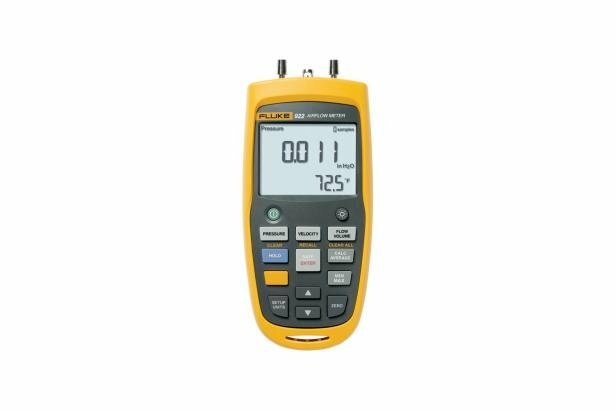 The Fluke 922 helps you analyze airflow. Easily. Analyze airflow. Easily. The 922 Micromanometer. Today’s HVAC technicians want a simple solution for diagnosing ventilation issues. Differential pressure measurements only tell part of the story. Technicians also want to measure air velocity and flow, without having to resort to expensive, difficult to use, specialist tools. The Fluke 922 makes airflow measurements easy by combining three tools: differential pressure, airflow, and velocity into a single, rugged meter.